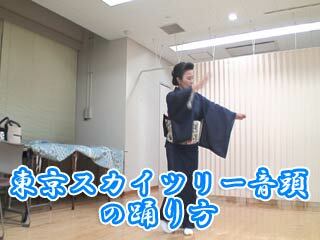 The video introduction of how to dance Tokyo Skytree Ondo (東京スカイツリー音頭の踊り方). Song: "Tokyo Skytree Ondo" by Hiroko Aizawa. Face to counter clockwise direction. 3 step to the right and swing hands 1 and half. From right foot, step 3 and palm up. Step 3 from right and draw Skytree. 2 Step back from right, hand down. Spin to the right on 4 count. Start from right foot and shade face with left hand. From the lower left, clap and step 3. Call on people from right hand and step, then left hand and step. Step right and draw Mt. Fuji.